While Kim Kardashian doesn’t feature on my list of women to look up to – I can’t help but have wondered recently if she doesn’t know a thing or two in the ‘contouring’ department that my increasingly sagging jowls and complete lack of any cheek bone definition could learn from. I’ve long lusted after the Anastasia Beverly Hills Contour Kit – a quick look at the before and after photos on the site will show why it should be a staple in the makeup toolkit for all of us that are cheekbone challenged – but at US$40 (so around AU$50 with the current exchange rate plus shipping to Australia) it’s not an everyday purchase. 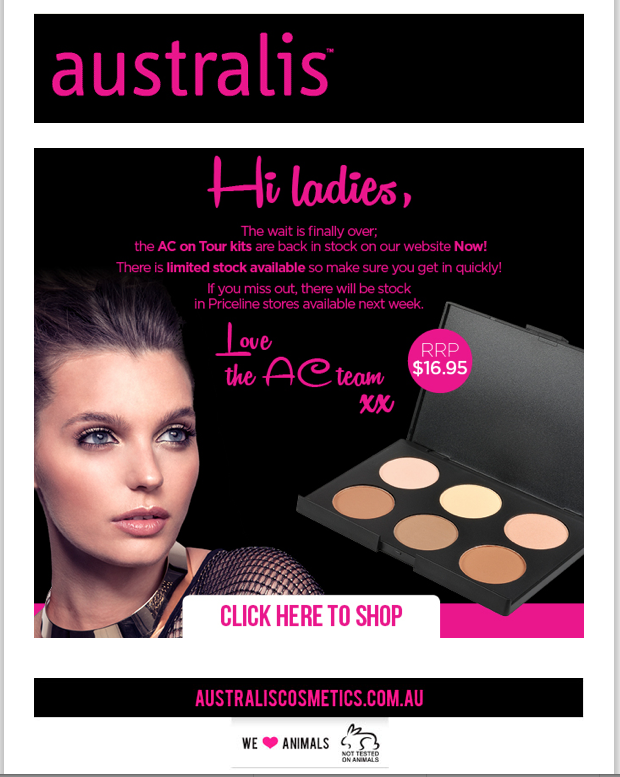 Well imagine my excitement then when at the beginning of this week an email landed in my inbox from the lovely people at Australis (we know we’ve mentioned before but ‘Australis heart animals‘ so we seriously heart them) to say that their own AC on Tour Contour Kit is back in stock and available on their website – and all for just $16.95. The kit comes with step by step instructions to show you how to use it – but do yourself a favour and watch this video from Ruby Golani. Skip to 3.20 and she shows you how to use the kit for a perfectly contoured finish.